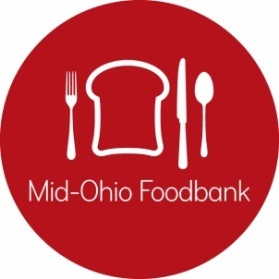 We are ecstatic that you are thinking about volunteering at Mid-Ohio Foodbank. Here you will find the answers to most, if not all, of your questions about volunteering with us. HOW DO I SIGN UP ONLINE TO VOLUNTEER? Volunteers can register for volunteer activities at VolunteerHub, where you can read about and sign up for upcoming volunteer shifts. If you are a new user, you will need to create a free profile by clicking on the “Sign in” link. Follow the step-by-step instructions to create and submit your user profile. Please note: To schedule a group, please register and sign up for the shift date and time slot you want. Then, contact our Volunteer Department (call 614.317.9703 or email us at VOLUNTEERS@MIDOHIOFOODBANK.ORG) to reserve slots for the individual members of your group. 13 years old for food sorting and packing in the warehouse. For Community Gardens it is 6 years old +adult per child depending on which projects are being assigned at that time. For Pantry Assistants in the Kroger Community Pantry, volunteers must be 16 years old or older, or they must be accompanied by an adult if between the ages of 11 and 15. Volunteers under 11 years of age are not able to assist in the Pantry. DO YOU ACCEPT COURT-ORDERED VOLUNTEERS? No, we do not accept court-ordered volunteers. WHAT SHOULD I WEAR TO MY VOLUNTEER SHIFT? No open-toed shoes (e.g. NO sandals, flip flops, or open-toed high heels) Comfortable clothes you don’t mind getting dirty. Because of the continuous lifting and repacking, we also recommend not wearing loose jewelry like rings, watches or necklaces. You may also want to wear layers – depending on the project you’ll be assigned to, temperature in the building and warehouse can vary. There is plenty of free parking. However, as part of our building’s LEED Gold Certification, we do encourage you to carpool when possible. Most of our volunteer jobs are around sorting, inspecting and repacking food donations. We do not assign them in advance as number of volunteers and packing priorities can change at the last minute. You may be inspecting food items for damage, boxing frozen meats, bagging produce, assembling care packages, or any other of a number of important projects! If you are volunteering in the Pantry, you could be helping to check in folks who are seeking for assistance, stocking shelves, assisting families in choosing their groceries, and/or helping people out to their vehicles. HOW DO I SIGN UP MY ENTIRE GROUP ON VOLUNTEERHUB? You can register on VolunteerHub for an account with your contact information. Then, find a shift on the schedule that works for your team. Sign up for one slot for that shift, then contact the Volunteer Department to reserve additional slots. MAY I BRING IN SNACKS? Yes, we do have a kitchen in the volunteer area where you can store drinks and, snacks or prepare food for your group. WHAT ARE THE VOLUNTEER SHIFTS? In the Food Sorting and Packing area we offer shifts Monday through Friday from 9:00 a.m. – Noon and 1:30 P.M. – 4:00 P.M.
Additional evenings and Saturdays may be added based upon our product levels. Please reference the Volunteer Hub link mofb.volunteerhub.com or call 614.317.9703 for these additional opportunities. Our on-site pantry is also open on Tuesday afternoons and evenings, Friday mornings, and Saturday mornings. Shifts vary during these time periods, so feel free to check mofb.volunteerhub.com for the most up-to-date information. DO I NEED TO SIGN UP FOR A VOLUNTEER SHIFT IN ADVANCE OR MAY I JUST SHOW UP? All projects must be scheduled in advance to plan for staffing and materials needed. Once you are scheduled, you will receive a confirmation e-mail immediately as well as a reminder e-mail (as long as you provide an email address) shortly before your shift. If you do not have an e-mail account, please contact our Volunteer Department to get full details.